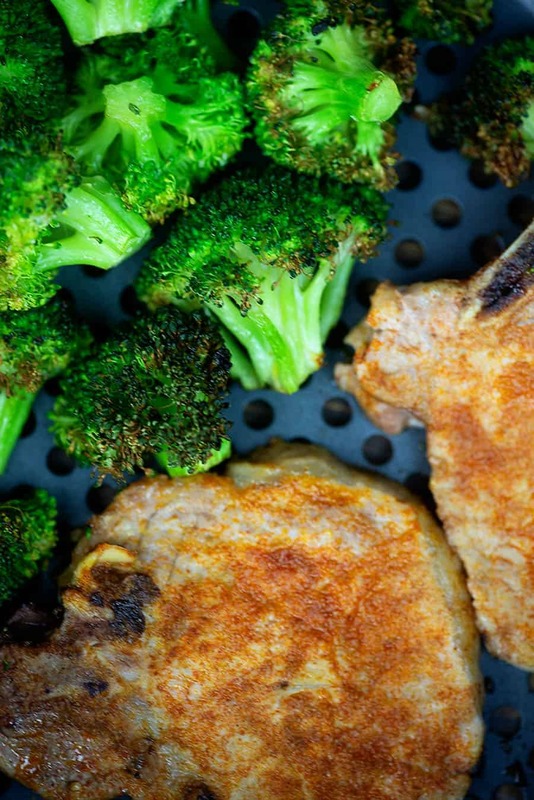 Air fryer pork chops and broccoli, cooked all at once for juicy pork chops and toasty roasted broccoli in the air fryer! This recipe cooks is ready from start to finish in 15 minutes! Raise your hand if you got an air fryer for Christmas last year! It seems like I’ve been getting so many requests for air fryer recipes after the holidays, that I’m guessing most of you have one by now. ? No worries if you don’t though, I’ll share how to make these air fryer pork chops in your oven in the recipe card below! I’ve got you covered! This low carb air fryer recipe literally takes 15 minutes from start to finish. Fastest dinner ever. The pork chops come out so juicy and flavorful! The broccoli is perfectly roasted with those nutty crispy edges that I am straight up obsessed with. First, we’re going to season our pork chops. Drizzle them with some avocado or olive oil. 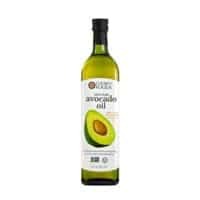 I’ve recently converted over to mostly using avocado oil and I love it. 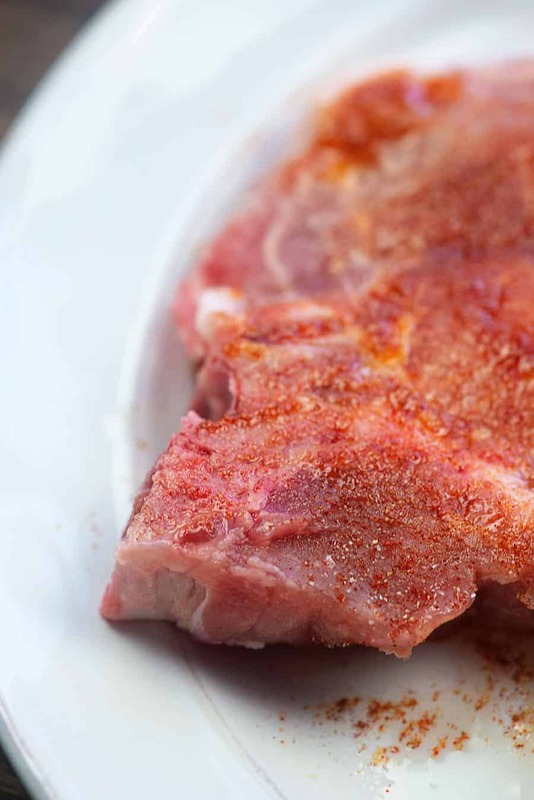 Season the pork chops with a mix of paprika, onion powder, garlic powder, and salt. Place the pork chops in your air fryer basket. Go ahead and place your chops in the air fryer at 350 for 5 minutes. They need a bit more time than the broccoli so we start it off first. 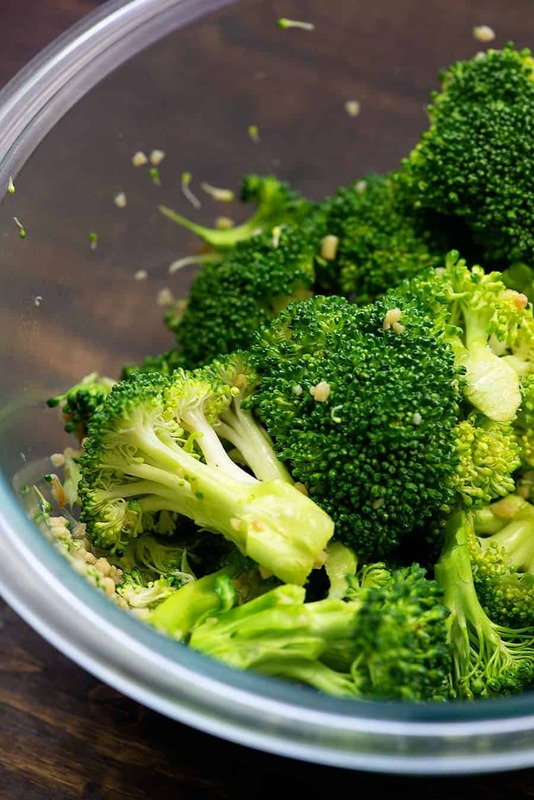 Grab your broccoli and toss it with some oil and freshly minced garlic. Sprinkle on some salt too, because broccoli is always better with salt. 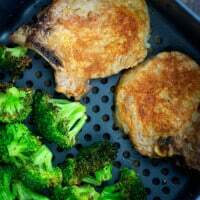 Once the five minutes are up on your chops, carefully remove the basket, flip your pork chops, and add the broccoli next to the pork chops. Pop it all back in the air fryer for another five minutes. I stir the broccoli about half way through to get an even roast. 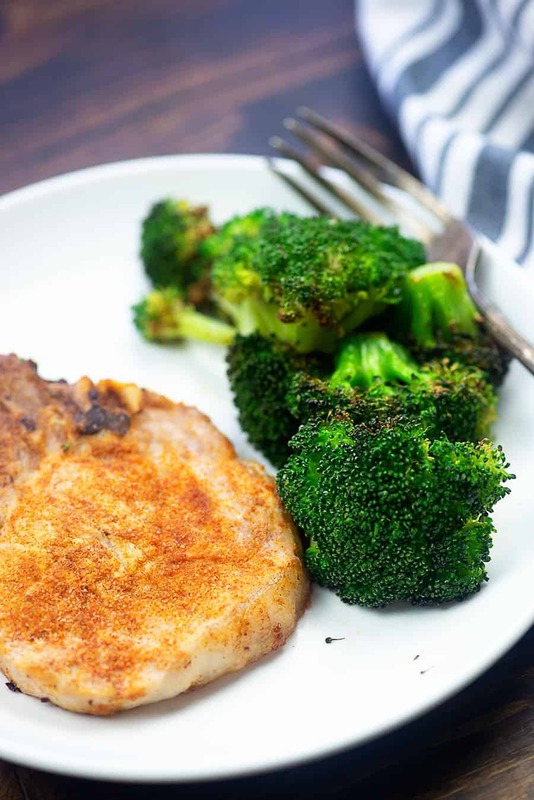 Juicy air fryer pork chops and perfectly roasted broccoli. Whip up some of my cheese sauce while the air fryer is going and you can top that broccoli off with some creamy goodness. I only have experience with one brand/model of air fryer, but I’m very happy with it and it has amazing reviews on Amazon, which is why I purchased it. 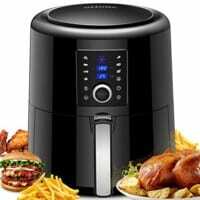 I use the OMORC Air Fryer XL. It’s 5.8 quarts which means that it’s large enough to hold plenty of food. Some of those air fryers are tiny (which is fine for small households! ), but I wanted a bigger one for my family of four. It’s dishwasher safe, too. Always a win in my book. Pork Tenderloin: I don’t think I’ve ever gotten more 5 star reviews on a recipe. You must try this one! Low Carb Chili: My family’s favorite recipe! Baked Shrimp Scampi: We’re always trying to squeeze in more seafood! Cauliflower Fried Rice: Skip the take out and enjoy this low carb meal. Crockpot Chicken Fajitas: We serve this over cauliflower rice for low carb burrito bowls. Air fryer pork chops are so juicy and this whole meal is ready in about 15 minutes! Preheat air fryer according to manufacturer's instructions to 350 degrees. Spray basket with non-stick spray. Drizzle 1 tablespoon of oil both sides of the pork chops. Season the pork chops on both sides with the paprika, onion powder, garlic powder, and 1/2 teaspoon of salt. Place pork chops in the air fryer basket and cook for 5 minutes. 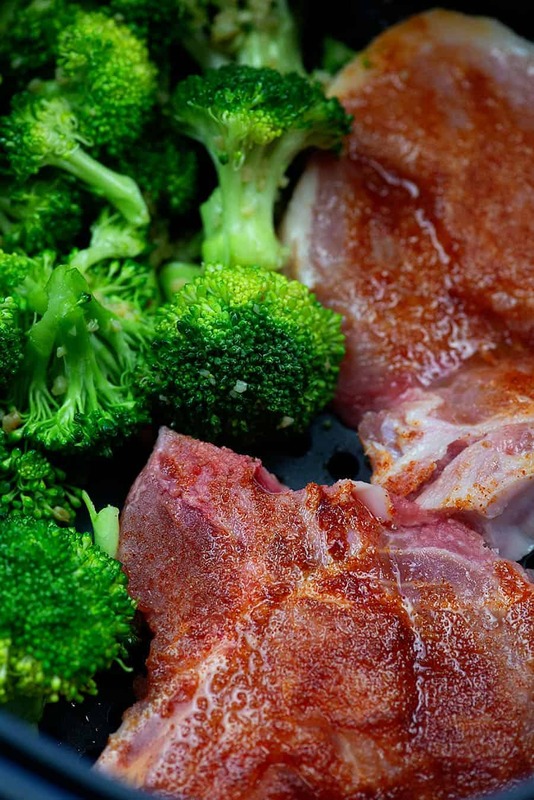 While pork chops are cooking, add the broccoli, garlic, remaining 1/2 teaspoon of salt, and remaining tablespoon of oil to a bowl and toss to coat. Open the air fryer and carefully flip the pork chops. 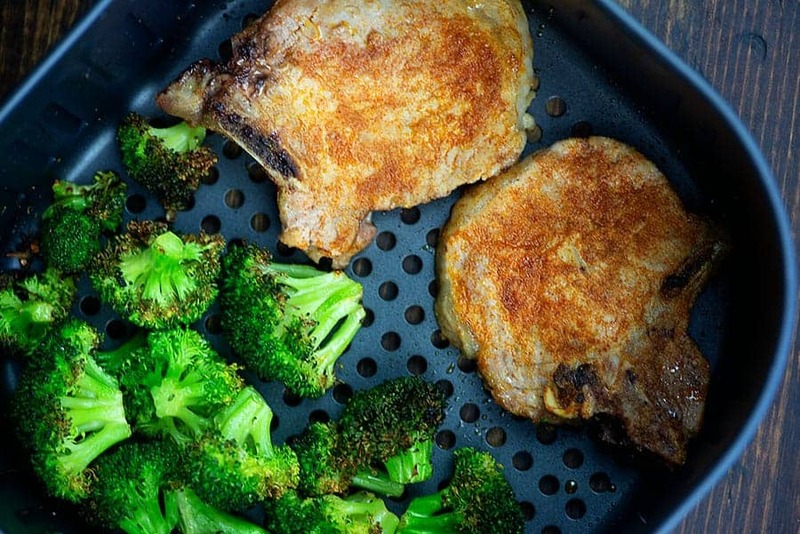 Add the broccoli to the basket and return to the air fryer. Cook for 5 more minutes, stirring the broccoli halfway through. Carefully remove the food from the air fryer and serve. To make this recipe in the oven, preheat to 375 and bake on a large rimmed cookie sheet for 30 minutes, stirring broccoli every ten minutes. I used pork chops that were about 1/2 inch thick. 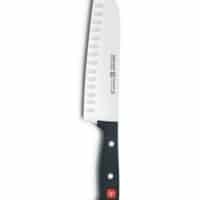 If using thicker or thinner pork chops, adjust cook times accordingly. If doubling this recipe to feed a family of four, I recommend cooking all four pork chops at once (assuming your air fryer is large enough) and then transferring to a plate and covering tightly with foil while cooking the broccoli.